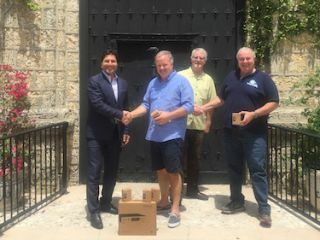 Media Vision’s CEO, Fardad Zabetian personally delivered the first order from its newest product line, a new assistive listening system, to the lucky first customer: Plymouth Congregational Church in Coconut Grove, Miami, FL. Plymouth Congregational Church is a historic church built in the oldest neighborhood of Miami 100 years ago by a single man and patterned after an old city mission church in Mexico. In 1974, it was added to the U.S. National Register of Historic Places. “The patrons were not satisfied with their existing assistive listening system; it had never worked,” said Paul van Puffelen of Southern Technical Support “We did a quick test of the new Media Vision solution and it worked without any issue.” The solution is a 5-user system including the Media Vision Stationary Base Transmitter and Portable Receivers with earphones and neckloop compatible with telecoil-equipped hearing aids. It is important to note that while houses of worship are not formally required to meet ADA requirements with respect to assistive listening, most recognize that they have acoustical challenges and that hearing loss is a widespread issue. The technology thus becomes essential for congregants to hear the service properly and receive the messages of inspiration. “We were happy to pick a solution that simply works with full coverage and clear audio,” said Mike Harris of Harris Audio Systems. “Who knew ‘to ship’ meant CEO Fardad Zabetian delivering them in person?” added Paul van Puffelen. The company disclosed that not all products are available for hand delivery.